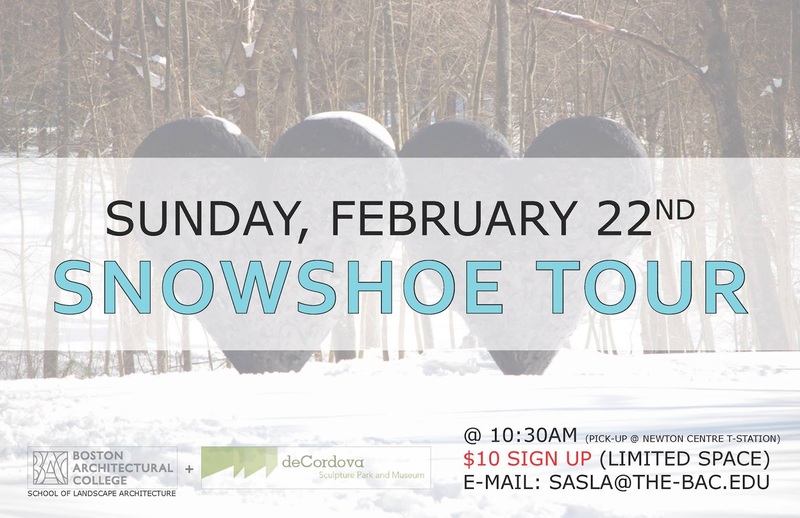 SASLA :: deCordova Snowshoe Tour! There are currently 3 spaces available on SASLA's re-scheduled snowshoe tour! The new date is February 22nd, and SASLA will be picking up students at the Newton Centre T station at 10:30am. The cost is $10 per student for snowshoe rental. The tour includes EMS snowshoe instruction and tour of deCordova’s sculpture park, your admission to the deCordova museum and discounted snowshoe rental ($10 for rental). E-mail sasla@the-bac.edu to sign up! *PLEASE NOTE: If there is no snow on the scheduled date the tour WILL go on as a "boot-tour"- wear appropriate boots for the melted conditions.